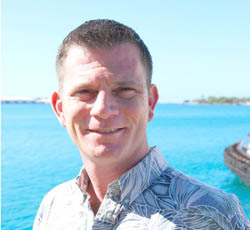 Hawaiian Tug & Barge/Young Brothers, Limited (HTB/YB) has promoted Michael MacDonald to Manager of Regional Operations III Hawaii. He will be responsible for overseeing harbor and charter operations. “Michael has an extensive amount of experience in maritime operations and operations management within our company,” Young Brothers, Limited President Glenn Hong said. “He has been an important member of our team and his military training and background will benefit him in his new role,” he continued. MacDonald joined HTB/YB in 2006 as Manager of Marine Safety, Quality and Environmental Protection and left to work for the Marine Resources Group, HTB/YB’s parent company, as Marine Safety and Quality Specialist. Upon rejoining HTB/YB in 2009, he held the position of Harbor Operations Manager. He served in the U.S. Marine Corps for eight years and in the U.S. Coast Guard for 11 years. He is a Desert Storm veteran and has earned several awards and commendations throughout his military career. He is a resident of Honolulu.